Agilent Technologies have expanded their digital storage oscilloscope (DSO) portfolio with six new models that comprise 1000 series. These new digital-storage oscilloscopes offer bandwidth between 60MHz and 200MHz. These oscilloscopes are available with two or four channels and each comes in a package that is 13cm deep and weighs less than 3.1kg. Agilent 1000A series oscilloscopes are equipped with a bright LCD display that offers a sharper image and is visible from a wider viewing angle. These oscilloscopes have up to 20kpts of memory per channel and allow engineers to use the full sample rate of the scope. Agilent 1000A series oscilloscopes can display 23 automatic measurements, up to 21 simultaneously including measurements from a built-in six-digit counter. These oscilloscopes feature sequence mode capability to find elusive problems. Engineers can record and replay up to 1000 occurrences of a trigger for identification of glitches and anomalies. Agilent 1000A series oscilloscopes offer a suite of DSP filters to help users to focus on the relevant spectral content of signals. 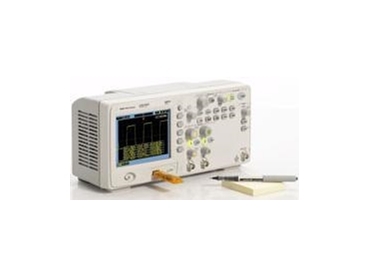 Agilent 1000A series oscilloscopes come standard with go/no-go mask testing capability, which allows inexperienced oscilloscope users to perform precise parametric tests. The user interface and front-panel labels are available in 11 languages to support worldwide teams. USB connections and IntuiLink connectivity software, which are standard features, make it easy to share and document measurement results. An optional training kit helps educators and production managers teach essential oscilloscope skills quickly.